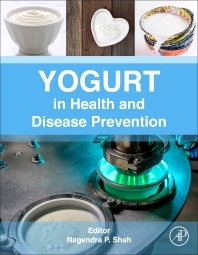 Yogurt in Health and Disease Prevention examines the mechanisms by which yogurt, an important source of micro- and macronutrients, impacts human nutrition, overall health, and disease. Topics covered include yogurt consumption’s impact on overall diet quality, allergic disorders, gastrointestinal tract health, bone health, metabolic syndrome, diabetes, obesity, weight control, metabolism, age-related disorders, and cardiovascular health. Modifications to yogurt are also covered in scientific detail, including altering the protein to carbohydrate ratios, adding n-3 fatty acids, phytochemical enhancements, adding whole grains, and supplementing with various micronutrients. Prebiotic, probiotic, and synbiotic yogurt component are also covered to give the reader a comprehensive understanding of the various impacts yogurt and related products can have on human health. 18. Bulgarian yogurt-like product "katak"
Nagendra P. Shah, B.V.Sc. & A.H. (Honours), M.Sc., Ph.D., CFS, FAIFST, FADSA, FIFT is currently Professor of Food Science at the University of Hong Kong, He served as a Professor at Victoria University, Melbourne, Australia, for over 20 years. Prof. Shah has a long and intensive research history in dairy foods and probiotics, prebiotics and functional foods.